Wearing your batteries; polymer-graphene capacitors. In spite of the progress in wearable devices, one challenge remaining is providing less obtrusive and cumbersome power sources. To tackle the problem, researchers at Case Western Reserve University developed flexible wire-shaped microsupercapacitors that can be woven into a jacket, shirt or dress. In this new supercapacitor, the modified titanium wire is coated with a solid electrolyte made of polyvinyl alcohol and phosphoric acid. The wire is then wrapped with either yarn or a sheet made of aligned carbon nanotubes, which serves as the second electrode. 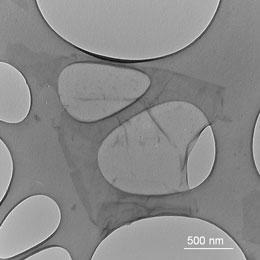 The titanium oxide nanotubes, which are semiconducting, separate the two active portions of the electrodes, preventing a short circuit. In testing, capacitance increased from 0.57 to 0.9 to 1.04 milliFarads per micrometer as the strands of carbon nanotube yarn were increased from 1 to 2 to 3. When wrapped with a sheet of carbon nanotubes, which increases the effective area of electrode, the microsupercapactitor stored 1.84 milliFarads per micrometer. 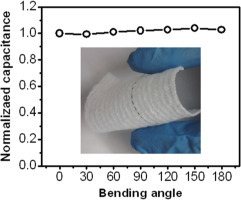 Whether wrapped with yarn or a sheet, the microsupercapacitor retained at least 80 percent of its capacitance after 1,000 charge-discharge cycles. To match various specific power needs of wearable devices, the wire-shaped capacitors can be connected in series or parallel to raise voltage or current, the researchers say. When bent up to 180 degrees hundreds of times, the capacitors showed no loss of performance. Those wrapped in sheets showed more mechanical strength. Three years ago, physicists from the University of Luxembourg theoretically predicted that certain compound materials made of polymers and flaky graphene, unlike those made of polymers and carbon nanotubes, did not increase the conductivity of the material to the degree that was generally expected. It was a surprising conclusion at the time which questioned the use of graphene in order to increase conductivity. Their calculations, now confirmed in an experiment with the Centre de Recherche Paul Pascal in Bordeaux, France, have however led to a promising discovery: the effect that put the conductivity of the plastics-graphene compound into question causes it to have remarkable dielectric properties, boosting its potential for use in highly efficient capacitors. The special dielectric properties of the compound material occur as a result of its liquid crystal properties impeding the arrangement of the graphene flakes into a conducting structure. So when there is an electric current, it does not flow directly through the compound, but instead generates a strong electric field. While in other compound materials the current permeable effect is the dominant one, the Luxembourg physicists could demonstrate mathematically that, in this case, the liquid crystal properties play the major role and are responsible for the unexpected properties. The chemicals company Solvay plans to continue the research around the new material.